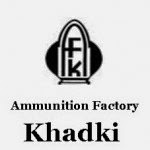 Ammunition Factory Khadki (AFK) has issued a latest recruitment in 2015 year to fill up Tradesman (Semi–Skilled) posts. Who are eligible they can apply offline mode by visiting official site of AFK official site www.afk.gov.in before last date. Candidates also check other details like exam syllabus, previous year question papers, sample papers, how to apply, exam date, admit card download, salary, and more information given below.